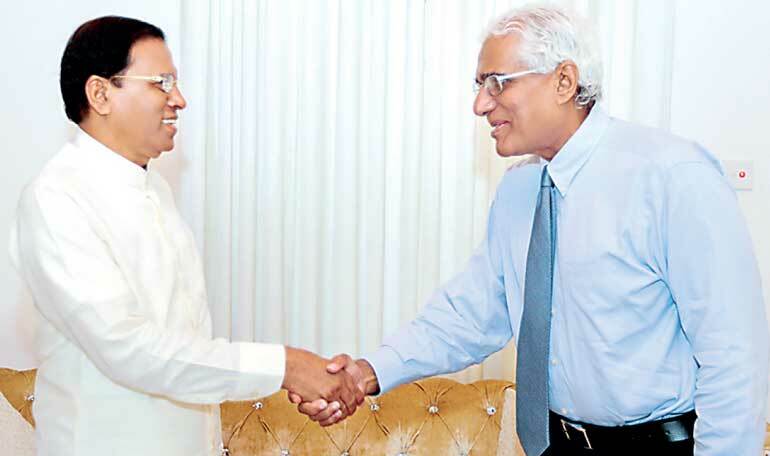 President Maithripala Siri-sena and Prime Minister Ranil Wickremesinghe who were at loggerheads and civil society activists finally found peace in Dr. Indrajit Coomaraswamy’s appointment as Sri Lanka’s 14th Governor of the Central Bank. After much controversy and lobbying by different stakeholders, the President on Saturday announced the appointment of ex-Central Bank economist and former Commonwealth official Dr. Indrajit Coomaraswamy as the new Governor of the Central Bank. “The decision was taken after a discussion held between the President and the Prime Minister Ranil Wickremesinghe,” the announcement by the President’s Office said. Dr. Coomaraswamy is scheduled to assume office today. The appointment put an end to weeks of speculation and a political crisis that threatened the harmony of the Unity Government of SLFP and UNP. Among eminent persons who were considered or in the fray were deputy governors Dr. Nandalal Weerasinghe and P. Samarasiri; former Central Bank Deputy Governor W.A.W. Wijewardena, Institute of Policy Studies Executive Director Dr. Saman Kelegama, financial consultant and academic Dr. Lalith Samarakoon, Minister of Development Strategies and International Trade Malik Samarawickrema’s Senior Advisor Dr. Indrajit Coomaraswamy, former Commercial Bank Chairman Dinesh Weerakkody, Senior Advisor to the Prime Minister Charitha Ratwatte, former banker and Ministry Secretary and currently UDA Chairman Ranjith Fernando, and former central banker Dr. H.N. Thenuwara. Prime Minister Wickremesinghe went public defending the former Central Bank Governor Arjuna Mahendran and was keen to re-appoint him after an anticipated clearance by the Committee on Public Enterprises (COPE) which is probing alleged failures on transparency concerning two Treasury Bond issuances. The Premier said Mahendran cannot be removed unless charges against him were proved. “We are not protecting anyone. If the charges are proved I will do the needful,” Wickremesinghe said on State-owned ITN on Thursday. “The Governor has said he needs to be exonerated from these charges, or there is no point. There may be charges but none of those charges have been proved yet. If it is proved, I will do what is necessary,” the Prime Minister added. As an interim measure it was claimed that the Premier was backing former Treasury Secretary and current advisor Charitha Ratwatte. This however was vehemently opposed by SLFPers backing President Sirisena. 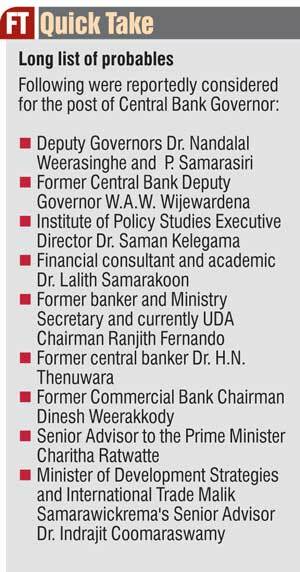 Daily FT learns that after evaluating many suitable candidates including Dr. Indrajit Coomaraswamy, the President on Wednesday 29 June had decided on Senior Deputy Governor Dr. Nandalal Weerasinghe . This choice was opposed by the UNP. Thereafter the search continued for a compromise candidate and Dr. Saman Kelegama was preferred by the President. This too was opposed by the UNP. On Friday, indications were that the President and Prime Minister would await the return of Finance Minister Ravi Karunanayake who as per the Monetary Law Act has to recommend any new appointment, as well as the Health Minister Rajitha Senaratne who were both overseas. As lobbying intensified, a key ally of the united government, former President Chandrika Kumaratunga stepped in to resolve the impasse. She too had recommended Dr. Coomarswamy. Sources claimed that Dr. Coomaraswamy was originally overlooked for the Governor post, and for a Ministry Secretary post last year because of his alleged close association with the former regime, where he served as an economic advisor ahead of the Commonwealth summit. However, Dr. Coomaraswamy is widely considered one of Sri Lanka’s best economists, whose credentials and integrity have never been in question. Educated at the Royal College, Colombo and at Harrow School in England, he gained his undergraduate degree at Cambridge University and obtained his Doctorate at the University of Sussex. Joining the Central Bank of Sri Lanka in 1973 he served in the Economic Research, Statistics and Bank Supervision Divisions as a staff officer till 1989. From 1981 to 1989 he was seconded to the Ministry of Finance and Planning. Thereafter he worked for the Commonwealth Secretariat from 1990–2008, holding the posts of Director, Economic Affairs Division and Deputy-Director, Secretary-General’s Office and was brought back to the Commonwealth Secretariat to head the Social Transformation Program Division, as Interim Director. Apart from being an advisor to Minister Malik Samarawickrama, Dr. Coomaraswamy was serving on the Boards of premier blue chip John Keells Holdings since February 2011 as well as Tokyo Cement Company Plc since March 2011. He worked briefly for Hatton National Bank , was a director of SEEDS (Guarantee) Ltd., and was a member of the University of Sri Jayewardenepura’s Board of Study (Public Administration) and a Director of the Nawaloka College of Higher Studies. Some also flagged his role in regard to the case of the Galleon Group of Lankan born hedge fund manager Raj Rajaratnam who is now serving sentence in US for insider trading. He functioned as special advisor to the Galleon Group and was director of a British company called Galleon Research Services Limited, a wholly owned subsidiary of Galleon International Management LLC. Whilst being an ex-central banker the appointment of Coomaraswamy is welcomed most financial analysts emphasised that the recent saga missed a golden opportunity of Sri Lanka reverting to internal succession at the Central Bank. Parachuting began during former President Mahinda Rajapaksa regime and it was pointed out that the country and the central bank would benefit in the long run if top post is filled by career central bankers. This, according to many, would, further incentivise professionalism as well greater independence and credibility at the monetary regulator. Unlucky 13 for Arjuna Mahendran? Following were among those who were reportedly considered for the post of Central Bank Governor.